how can i run this on windows? what are the process to run the app engine? Anonymous, use the link in the post to download the Windows version of the Google App Engine SDK. Then tweak server/ae_pushserver.sh. Currently it is a Unix shell script but is only one line long. Turning it into a .bat file should be easy. I have never tried the App Engine SDK on Windows but it should work then without any further changes. I added Urban Airship's link to the post, when I mention alternatives. Doing a comparison of C2DM to these would be an interesting project, maybe I do it once I get out of this pretty busy period. One thing to note: the server part of the solution that uses TCP stream to simulate push may look easy but the scalability problems should not be underestimated. Very quickly you can end up with a server that needs to handle 10s of thousands of 100s of thousands TCP connections - mostly idle connections though. As far as I know, direct UDP to devices is blocked by operators at various levels. I think im not configuring the pushserver.py you posted properly. The emulator seems to register fine as i see no error in the DDMS when i register. Do you try to run the server part in the SDK as proposed by the post or have you deployed it on Google's servers? OK, one more. Do you know exactly which part is unauthorized? The Android client may receive this error message when it talks to the Google App Engine SDK. Or the server part may be unauthorized when it tries to connect to Google's push server. 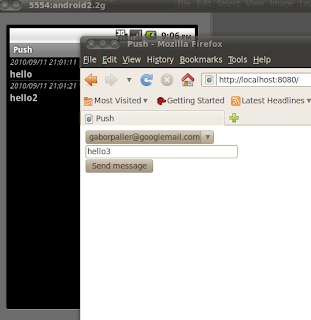 Have you configured a valid Google account in your emulator? but I believe the simulator is registered as my simulator email is appearing in the dropdown menu. I am going to try running it on Google's server and see what happens. This is strange, I have just tried myself and it worked fine for me. Can you see the "onRegistered() done" message in the Android log? (adb logcat). There is a chance that the server side stored the registration with an earlier, successful registration attempt (this simplistic server never deletes a registration). The registration goes well on the device. I see the onRegistered called in the "adb logcat" stream. I'm not sure what part on the server is not authorized ? I'll keep looking for, if found will update. yup I get the "onRegistered() done" in the log ill keep trying if I get it working I will post. btw, I have it running on windows. Also, I changed IP addr in the Config.java to point to my machine. I put a Log in the sendToken method of the NetworkCommunication.java. I see that the authToken is null. Do you think this could be an issue ? "Also, I changed IP addr in the Config.java to point to my machine. " That's not necessary. That particular IP address in Config.java is the localhost of the machine running the emulator. It is an Android emulator convention. The reason is that localhost or 127.0.0.1 on the emulator refers to the Linux running the Android framework, the phone itself. In order to get to the real localhost (the PC running the emulator), they came up with that special address. I have never tried this trick in Windows but it should work there too. "I see that the authToken is null. " Have you configured a valid Google account in the emulator's Settings/Accounts menu? I got the IP thing. But changing the IP is necessary if running on the device (which i did). Right ? And I have a proper google account set up on the emulator. And as I said I ran it on my device, which has my google account set correctly, still I get a null token for some reason ! Today I was planning to try and explicitly use the setPassword method of the AccountManager to see if it works.. Let me know if you have any suggestions. Now, I'm able to get the token. However, the server is still not happy with me. It still says Not Autorized 401 ! OK, I managed to reproduce it. When you start the Android client application and select the account, have you noticed the small black triangle in the upper left corner of the phone screen, in the notification tray? This warns you that you have to grant first right for this application to access ac2dm token. Also, for good measure, I added --clear_datastore to the script starting the server but I don't think it was the cause. Well I found out that you really don't need to send anything else than the registration id from the device to the server. The server should use the authToken not from the device ID but the one which is acquired by using the ROLE Account (your gmail id in your app case). This authToken you can acquire by any means (say curl) by using your password. So I got into their whitelist using my email id and then got the authToken using the curl command. Used this while positing the message to the server. I would again like to thank you for writing this tutorial which simplified a lot of things. I have also put together an article in my recently started blog. I have a link back to your blog as well as your name on it. I linked to your post. Thanks again. I am getting below error any pointer would be highly appreciated.. one more thing from push example during registration you are always sending sender is as gaborpaller@gmail.com. I am getting below error any pointer would be highly appreciated.. Anonymous, is your device 2.2 and is Android Market available on the device? If it is an emulator, have you created the virtual device as 2.2+Google APIs? I get this when I push a message. Did anyone get this error?? I checked out the link http://code.google.com/appengine/kb/general.html#rpcssl but it gives me a patch to python for the ssl package but I have python 2.6 and the patch doesnt work on it. Thanks for your post. It's very helpful. However, when I try your example, I got below error. Is there anything wrong? Thanks. yu, did you install the ssl module as the link at the end of the exception proposes? The version of my python is 2.6.5. So the SSL module does not need to install. Currently I have to change https://... to http to avoid exception. But there should be a better solution. Do you also have this problem if you deploy on the real Google App Engine or only with the SDK? Not yet. The error appears on my local machine. Another question is, is there any document about the length of registration ID? Thanks. I'm getting the same cert error reported by yu. I have python 2.7.1 installed. I'm also running the SDK on my local machine. Ack. Never mind - after some research, I see now what yu meant about changing https to http - that has to be changed in the pushserver.py script to work around the issue. Once I did that, that app worked. Thanks for an excellent tutorial, Gabor! I changed https to http, the exception is gone, however, I got "Message sent, status: Unauthorized, Error 401" message. Can you explain how did you solve the issue? Never mind. It is working for http mode. 2011-03-16 00:14:23 Running command: "['C:\\Engine\\Python32\\python.exe', 'C:\\Program Files (x86)\\Google\\google_appengine\\dev_appserver.py', '--admin_console_server=', '--port=8080', 'C:\\Subversion\\push\\server\\pushserver']"
Apologies. Got it working. Was using an unregistered google account id. So, any one knows what should i do ? I m able to deploy it and work properly, can u please enlighten me how u wrote server side python script?
" No registration for 'mymail@gmail.com' "
pandez, have you registered your account with C2DM? Link in the post. i have registered my account with c2dm . i receive google invited mail already. Martin, you need to have the Google extensions installed (Google APIs). When I try to register my emulator by going in settings/Accounts & Sync/Add account, I get following alert after adding my details. "Set up could not finish. Unable to open connection to server". Note that I've active internet connection. I'm running it on windows. What are the changes that need to be done from the source code provided here? I'm new to android development, so any help appreciated. When I open http://localhost:8080 in web browser i can't see my registered username on the list. I have already registered my account to google c2dm. Also when i try to send some message i get an error as "No registration for '-'" . How do I resolve this error? Can anyone post some help for the client side. How do i import the package into eclipse? Is there any other way to get the .apk file? Unknown, personally I would create a new Eclipse project and would copy code/resources into the new Eclipse project from the Android project that can be downloaded from here. But here are some more sophisticated advices. Thank you Gabor, it worked!!. i´ve changed config.java in client, pushserver.py, ae_pushserver.sh (wich has changed to bat) in server side. Started the push app in the emulator and selected the account but i dont get the "Register" message and also it doesn´t apear in the drop down list in my browser. Finally i got the register message. After that i had the error mentioned by "yu" and after changing https with http on pushserver.py it worked. Thank you all for the help, now the next step is to know exactly how the code works.